Did you mean " "? Adjustable skid shoe made of metal for the Cotech Two-Stage Snow Blower 31-4777 (DB7655). Also compatible with the Cocraft Two-Stage Snow Blower, 41-1580 (KCM22B). please refer to our customer service or local Clas Ohlson store. Online store Out of stock This product is not available in your chosen store, please contact Customer Service. Spare parts are not carried in stock in our high street stores or online. Please order them in your store or by phone. Feel safe: all credit card information is encrypted with Extended Validation TLS Certificate, capable of up to 256-bit encryption. Delivery cost – How does it work? From £4.99 for orders under 30kg and/or 1m or FREE if the order is over £35. All orders over 30kg and/or 1m from £9.99. We accept all major credit cards. You can pay with PayPal. Choose the payment option that suits you the best. We are proud of our products and it is very important that you, as a customer, are happy with the service and products we provide.This is why we have a 2 year guarantee on most of our products and on specific products we leave a 25 year guarantee. The only exception is on consumables (such as batteries and light bulbs). Keep a look out for our guarantee-logo next to your chosen product to see what guarantee package it has. Our guarantee means that the product is expected to work just like we have described it during the time of guarantee we have promised (This in addition to the rights under consumer purchasing). * Provide proof of purchase. * Return the product within the up to 90 day period. * Return the product and accessories in the same condition as when purchased. 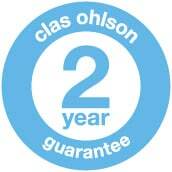 Useful products and solutions have been our passion at Clas Ohlson since 1918. Covering all things home, multimedia, electrical, leisure and hardware, we have 1000s of ways to help you solve everyday practical problems. Next day delivery as standard. Receive the latest product news, offers and solutions directly to your inbox. Please enable cookie support to enhance your shopping experience.